Cavas Wine Lodge, a Relais & Chateaux hotel, sets a new precedent for vineyard-luxe. Even in winter, when leaves and fruit shrivel and brown, this posh outpost nurtures guests with meticulous service, excellent cuisine, and warm, involved owners. Billed as “The first luxury lodge in the foothills of the Andes,” Cavas Wine Lodge takes some effort to get to, but you’ll be pining for it when you leave. You turn off the main drag and onto a dirt road past an endless series of vineyards, before pulling up to the inn set within blooming foliage and rows of grape vines. 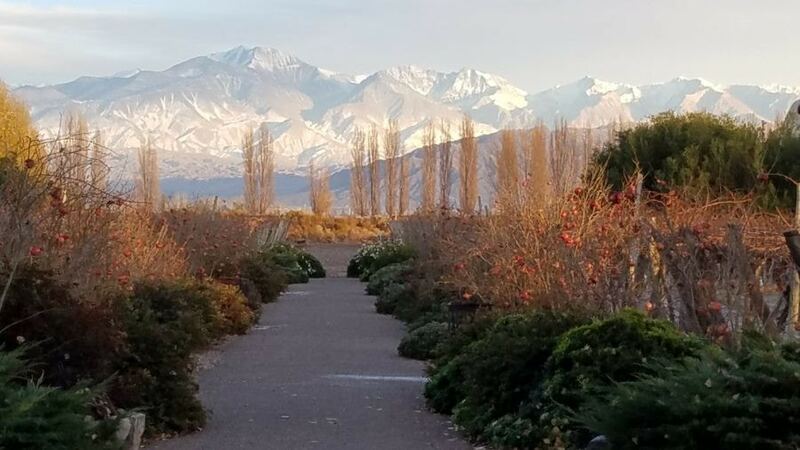 But the star of the landscape is the Andes Mountain Range – a backdrop so divine, you’ll want to photograph it at all times of day (though it’s particularly stunning at sunrise). Reception, as you can imagine, is intimate and warm – and of course comes with a glass of wine. Owner Cecilia Diaz Chuit, a beautiful Tea Leoni doppelgänger, is so gracious and down to earth, she looks guests in the eye and takes their hand when she speaks – unexpected and enchanting from someone who lives in such a place. She makes guests feel right at home. The main lodge is contemporary in design, yet comfortable with plenty of cushy seating inside and out, and encompasses the restaurant, a downstairs wine cellar (used for wine tastings), a small gift shop, and just past an outdoor pool, a small, but professional Spa. Several stylish villas, housing generously sized rooms and a couple of house-dimensioned accommodations, are a short walk from the main building. There are two “Half Villas” – each includes its own (unheated) pool, three bathrooms, a living room, bedroom, outdoor Jacuzzi and double shower. If it’s winter and near sundown, you’ll want to call for the kindling of a fire on the roof deck, which will keep you warm as you reflect on this magical moment while the sun descends over the mountains and vineyards and the sky turns into an inky canopy of stars. If this doesn’t impart peace and tranquility, nothing will. For a treat – set up a wine tasting in the atmospheric wine cellar downstairs. If your relationship is heading towards forever after, you might feel compelled to pop the question here. Breakfast, lunch, and dinner is top of the line – which is a good thing because you won’t want to leave the property. Paired with local Malbec, everything tastes exceptional. There are about 900 wineries in the Mendoza Region – with 180 open to the public – reservations required. Paul Hobbs Vina Cobos opened in Mendoza in 1999. Famous in Napa Valley California, Hobbs was drawn to Mendoza for its potential (and beauty), purchasing this property with the Italian Marchiori family because “Malbecs were here.” Lucky guests can sip Cobos Malbec in a contemporary cement and glass building, and learn about what makes this region so special. Finca Decero means “from zero” or “from scratch,” referencing what was here when a very wealthy Swiss cement tycoon bought this land to establish a winery. Now, the vineyards are full of all manner of red grapes: Malbec, Cabernet Sauvignon, Syrah, and Petit Verdot – and you’ll want to try them all in a stunning landscape and casa. Rooms and Villas from $390 off season to over $1,300 for half villa in high season per night (half villa is $700 off season per night). Includes breakfast. Many packages available include transportation from the airport (about an hour’s drive), and meals.